The first time I started thinking about chipper shredders was a year ago last fall, when I was faced, once again, with the mountains and mountains of my neighbors' leaves that always wind up blanketing my front garden. Dealing with these leaves is no small task, as I've detailed here. I've had people suggest that I simply leave them in the beds, but this underestimates just how many leaves we're talking about. I'm all for a winter mulch, but not for whole scale smothering. Furthermore, the sheer volume of leaves is not immediately compostable. That is, they simply won't fit into my two compost bins. At times, I've had up to 20 large yard bags full, and they can lie around for months, waiting to be mixed in. I needed to shred the leaves I gathered, simply to reduce the volume. This, as it turned out, was more than a bit of a wrinkle. A machine big enough for the task was too expensive, but renting one was almost just as much so. In the end, I used a combination of a leaf blower (not big enough for the task, as it turns out) and a neighbors' industrial-sized lawn vacuum (hard to handle), which I run over the piles after I've raked them out of the beds. The second time I started thinking about a chipper shredder was that following winter, when this ice storm brought down tree limbs, not just in my yard, but all over town. My neighbors and I saved what we could of the icefall for firewood, but even so, a lot of material went to the landfill when it could just as well been chipped up and used as mulch. Except that I just couldn't see owning a machine that would cost upwards of $800 (the price of Troy Bilt's top-of-the-line chipper shredder, the CS 4325) when I would probably only use it a couple of times a year, at most. It just seemed...extravagant. But what if it weren't just my chipper shredder, but it belonged to the whole neighborhood? I'll admit that this idea had already crossed my mind before Troy Bilt contacted me. When I was trying to find a solution to all the downed limbs from the ice storm, I'd briefly considered approaching my neighbors about purchasing a chipper shredder together. But, as usual, I got distracted before I ever acted on it. Now the opportunity had fallen into my lap. Even so, I thought I should poll the neighbors and see what they wanted me to get, letting them know that it would, in effect, belong to all of us. As it turned out, every single one of them picked the chipper shredder from the catalog. It seems I wasn't the only one feeling the need. The bag that the leaves feed into is easy to attach and detach, and is of a size that is convenient to handle. The machine is extremely easy to start and operate, and is set up so that it is as safe as operating a lawn mower. The machine itself is very large, but while heavy, it wheels around nicely on two large tires. It comes with an attachment for a riding lawn mower (which I don't own), so you can pull it some distance that way if you needed to. 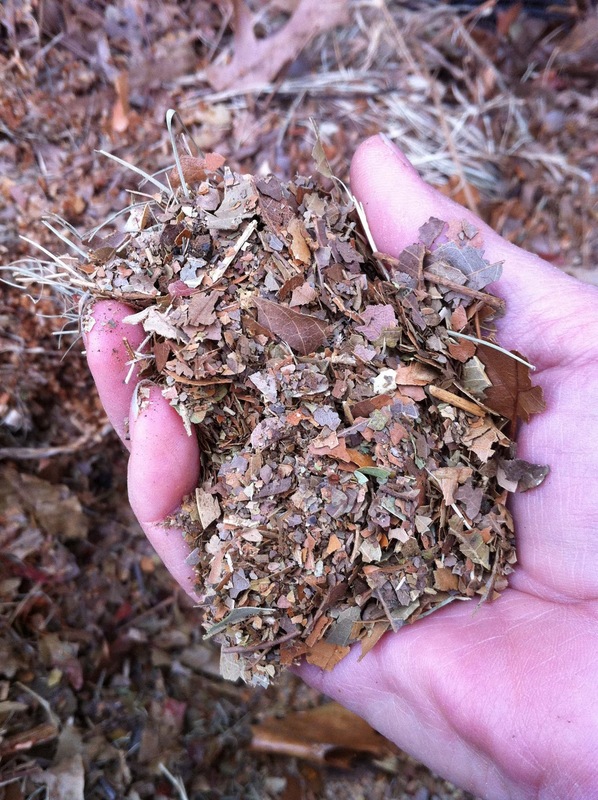 The only hitch in shredding operation that I noticed was that if there are largish sticks (greater than six inches or so) in the pile of leaves, they tend to get crossways at the bottom of the hopper and prevent leaves from feeding into the blades. Whenever that happened, I had to stop operation, turn off the chipper shredder, lay it on its side and fish the leaves out to get to the stick causing the problem. The stick was nowhere near the blades whenever this occurred, but I would disconnect the spark plug anyway, just because I'm a cautious person. This was an inconvenience, but not really a fault with the machine itself. Once I figured out what was going on, I was simply more careful to pull the sticks out before feeding the leaves into the hopper. Finally, the machine is LOUD. You won't want to use this in the early morning hours. It is also BIG, and it took up a lot of space in the shed. But fortunately, about the time I put the chipper shredder through its paces with the leaves, I got word that the South Plains Food Bank GRUB farm was thinking about buying one for their orchard. I contacted them and we have now made an arrangement to have the chipper shredder on permanent loan at the farm. * They get a free chipper shredder, I get storage, and my neighbors and I can come use it on the few occasions we ever need one. A perfect alignment of community needs. In part 2 of this review, I'll report on how well the chipper works on the chores at the GRUB farm's apple orchard, and give my final impressions on the machine. *Note: I have agreed with South Plains Food Bank to pay the taxes on the chipper shredder and retain ownership of it. Very nice idea sharing it. I wish we had one to share in our community. I think I'll post it as a suggestion on our community message board. WOW that is really kind of you! I wish we had a community machine like that! That is a crazy-awesome arrangement you have going there. Well done! Actually, I'm doing a research project on resource sharing... do you mind if I use this post as a source? Jackie, Mary, Su--I'm hoping everyone can benefit from this. It's also worth noting that Troy-Bilt was totally on board with the idea. Su--Feel absolutely free to use the post. Great to see you back Susan - hope you're feeling ok now. Shredded leaves - don't you make leaf mould over there? Rather than put them in the compost, I would store them separately from the rest of the stuff and leave them to really break down well, then when it's all crumbly use it as a great soil conditioner. Love the idea of the community resource. Where I live (Bath, England) a group of residents are lucky enough to have a piece of land we rent from our local council and about 10 years ago we planted a community orchard. It is now very productive, provides a peaceful spot for picnics and reflection, lots of wildlife, and a great place to get together occasionally for work parties. Deborah--I thin your leaf "mould" is what we call "mulch," and I've used some of the shredded leaves for that, too. But there is a LOT of leaf material to deal with, so much of it is going into the compost heap as well. By the way, I use the mulch primarily to keep the soil moist in our dry climate. Susan, Now that's a twofer! A win-win and a clever idea!